Preschool cut and paste activities are simple art techniques used in the classroom. Start by introducing your students to different types of paper, such as construction, tissue, cardboard, crepe paper, gift wrap, wallpaper samples, waxed paper, and more. This list is endless. As the children practice their cutting skills with these papers, the next step is to paste or glue these onto a base to produce an art form or project that the child can be proud of. Speaking of paste, in the past school paste was a given product, but it was thick, hard to spread, and crumbled when it dried. It's better to use white school glue which is non-toxic and easy to wash off of small fingers. Yes, you can see the glue while working with it, but it dries clear which makes for a nice finish on the children's art. Glue sticks have become popular and handy, however, these are best for small projects that need just a little bit of adhesive. The last tool is safety scissors so preschool children can practice their fine motor skills when cutting paper. Just playing with these few tools (scissors, paper, and glue) should get the children's creative juices flowing. Below are a few projects to try. Allow the children to experiment with arranging the torn paper pieces before gluing them in place. Note that this is only one type of picture that can be made with torn paper pieces. Brainstorm with the children for more ideas. Invite the children to practice their cutting skills making inch-wide strips from sheets of colorful construction paper. After each child has about 6-8 strips, invite them to manipulate the paper strips using two techniques, to either roll the strip around a pencil to make a curly coil or to fold the strip back and forth (accordion style). 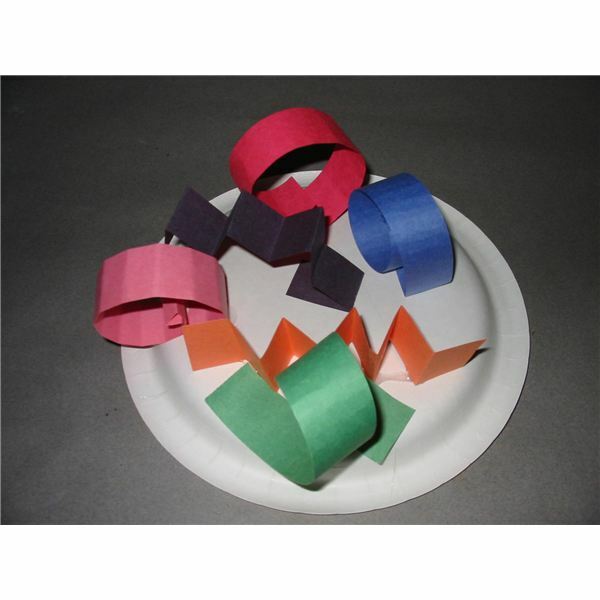 Let the children glue these strips onto a base like paper plates or a box lid in any design they wish. This is a fun collage for children to design and make. Collage is a French word that means "to paste" or "to stick." For a variation, allow the children to decorate the strips with crayons, markers, or adhesive stickers prior to curling. A colle is an art technique where scraps of paper are pasted to provide decorative and tactile additions. Provide old magazines for the children to look through and tear out pictures. With safety scissors, have them cut the pictures into shapes that will create a scene or design. Let them paste these shapes onto a sheet of colored construction paper. Arrange the pictures where some are alone and others overlap to create a textured effect. There are many preschool cut and paste activities to choose from in art. Think about mosaics, positive/negative method pictures, making confetti, cut paper designs (like snowflakes), and tracing shapes and making cutouts. Enjoy the art of cutting and pasting with your students – there are projects for every theme, season, and holiday to create.